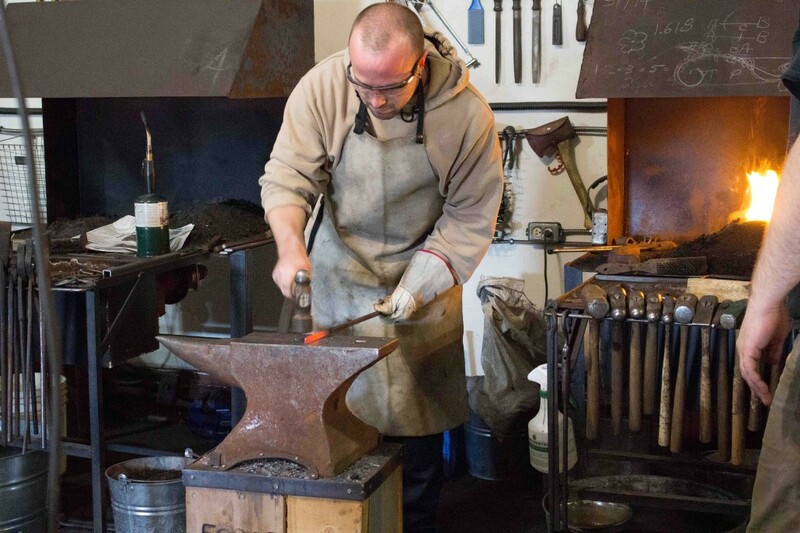 Blacksmith Workshops - FireHouse Ironworks Ltd.
Have you ever watched a blacksmith at work? 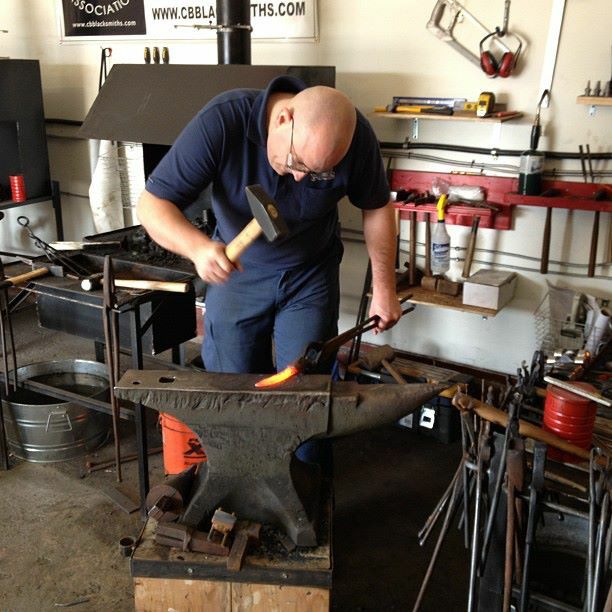 There is something mesmerizing about the sound of a ringing anvil and the hot sparking energy of the forge; the concentration of the blacksmith as they manipulate fire and iron to their will and design. 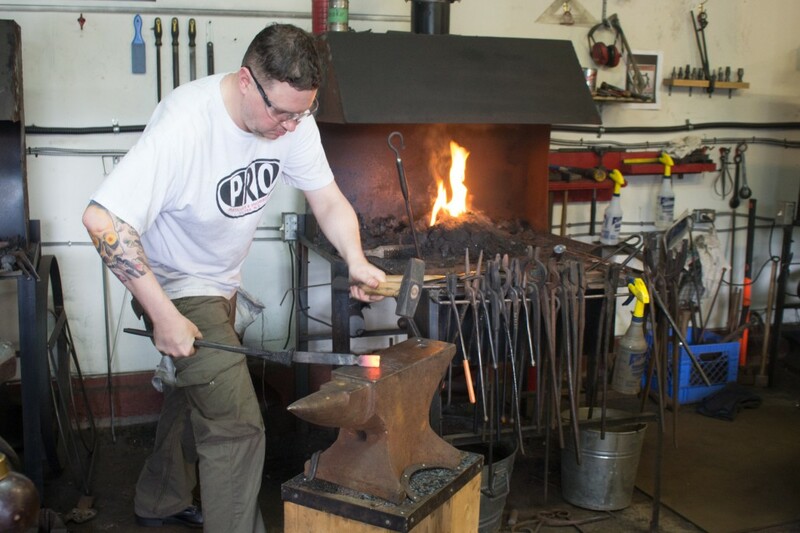 At FireHouse Ironworks Ltd. we invite you to experience first hand the ancient craft of blacksmithing. Connect with an art form that has played a vital role in our built and cultural heritage. 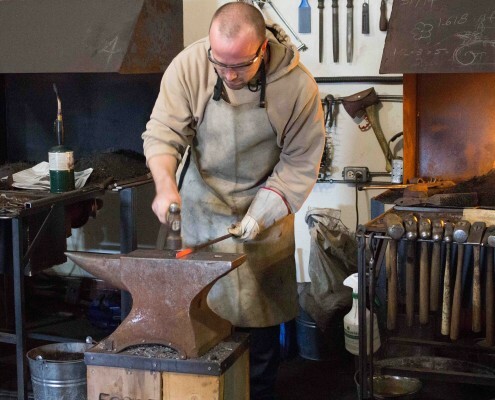 The blacksmith has built tools, weapons, machines, engines, architectural forms, furniture, household and farm necessities, and inspiring pieces of art throughout the ages. 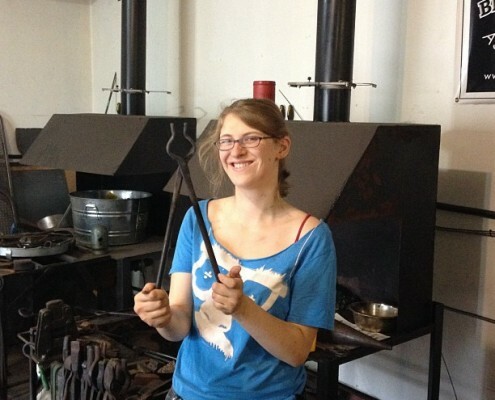 Learn the basics of working with iron in a traditional forge; or take a week long workshop where you learn to build a piece of your own design. 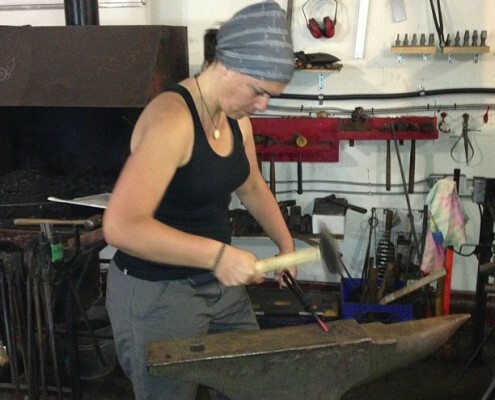 Go home with new skills that can be applied to your own projects at home. 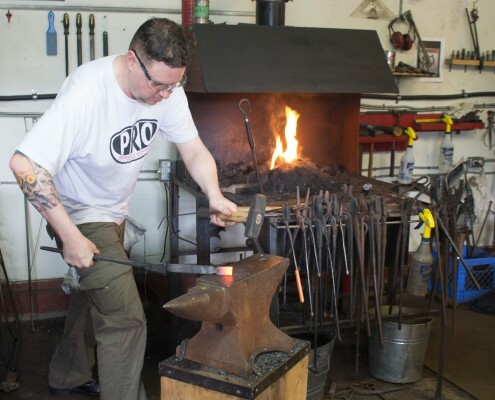 At FireHouse Ironworks Ltd. we have the knowledge and facility to help you learn to blacksmith in a relaxed and safe environment. 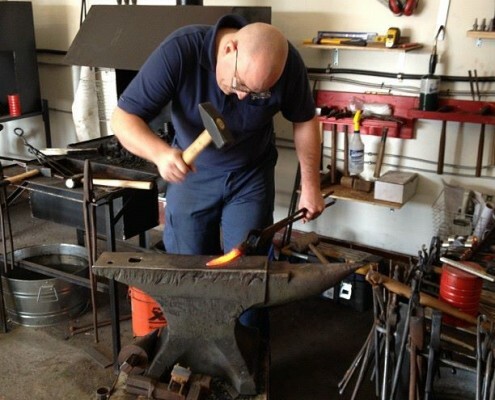 FORGE SAFETY, FORGE / FIRE CONTROL, HAMMER CONTROL, TOOL USE, HAMMER DRESSING, PROPER TOOL SELECTION, STANCE AND SWING MECHANICS, MATERIAL SELECTION AND LAYOUT, HEAT COLOUR IDENTIFICATION, BASIC SMITHING PRINCIPLES AND TECHNIQUES, YOUR OWN SHOP LAYOUT. A GREAT INTRODUCTION TO THE CRAFT. 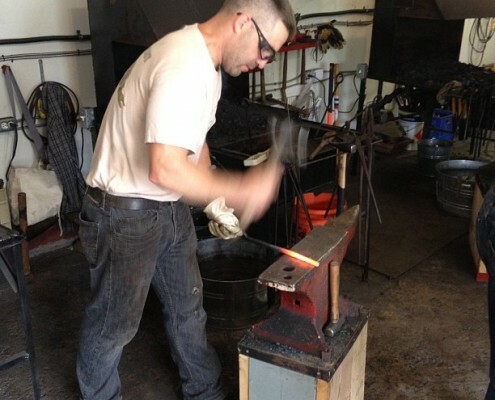 MECHANICS OF BLACKSMITHING, DRAWING OUT, TAPERS, BENDING TECHNIQUES, SIMPLE TOOL DESIGN, TWISTS, FULLERING, LEARN SYMMETRY AND UNIFORMITY, LEARN HOW TO MAKE FUNCTIONAL ITEMS AND TOOLS, LEARN HOW TO TURN YOUR IDEAS INTO REALITY, STEEL USAGE AND IDENTIFICATION, SMALL PROJECTS MAY INCLUDE A FIRE POKER OR A SET OF FORGE TOOLS TO USE AT HOME. PUNCHING AND DRIFTING AND SLITTING, HEAT TREATMENT, JOINERY TECHNIQUES, PRACTICAL FORGE TOOLING, FORGE WELDING TECHNIQUES, ADVANCED FABRICATION TECHNIQUES. 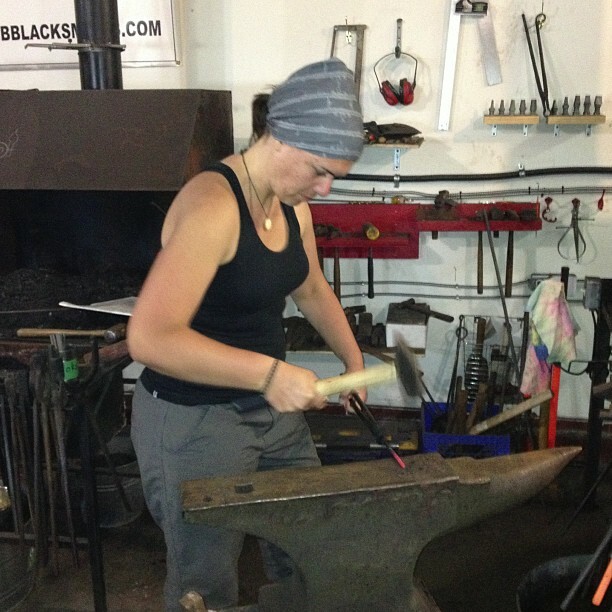 PROJECTS MAY INCLUDE HINGES AND LATCHES, PINTLES ETC. ORGANIC ELEMENTS. 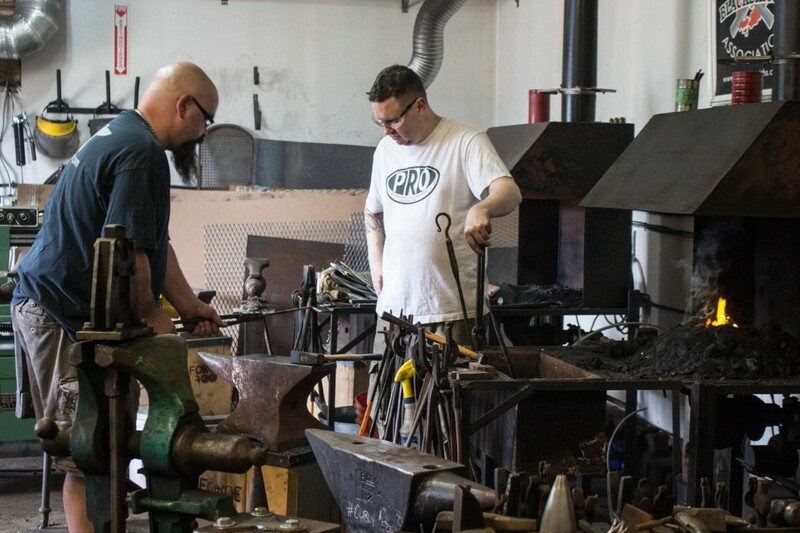 INTRO TO DIFFERENT WELDING / CUTTING TECHNIQUES FOR THE MODERN SHOP. 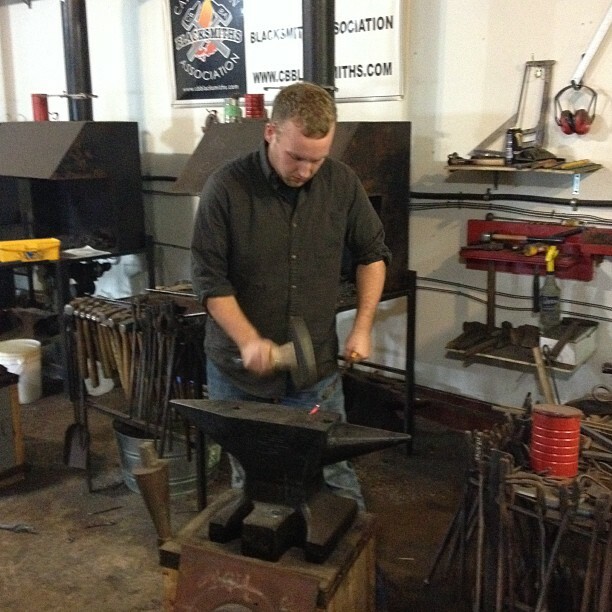 SKILL ASSESSMENT OR COMPLETION OF THE INTERMEDIATE AND/OR BEGINNERS CLASS. 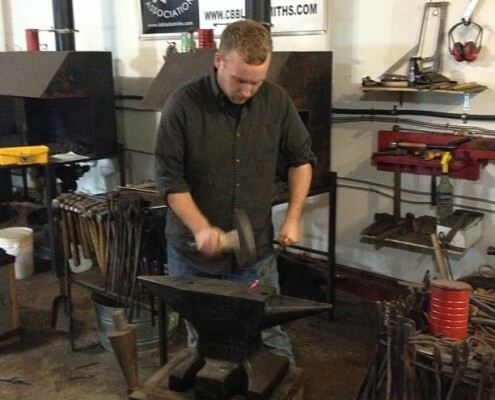 FORGE WELDING IN DEPTH, ADVANCED PROJECTS USING ALL BLACKSMITHING TECHNIQUES, ADVANCED JOINERY. MIG / TIG TECHNIQUES AND SAFETY, PLASMA CUTTING. 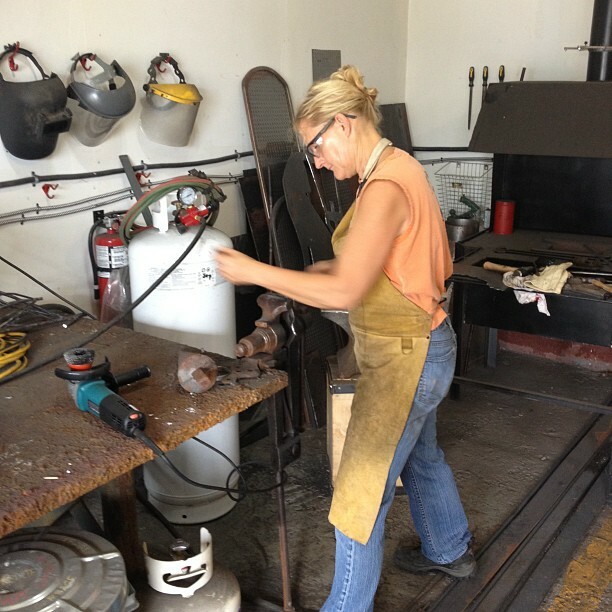 We also offer private custom workshops. 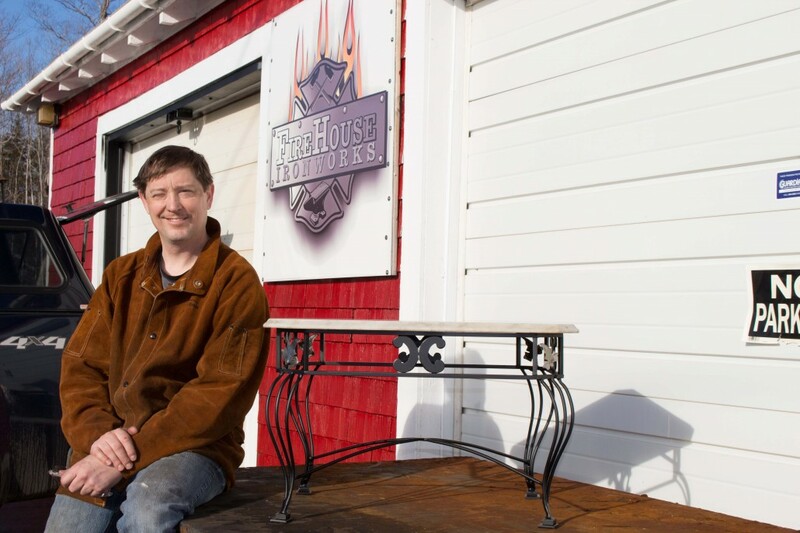 Whycocomagh is located on the shores of the beautiful Bras d’Or Lake on Cape Breton Island, Nova Scotia, Canada. 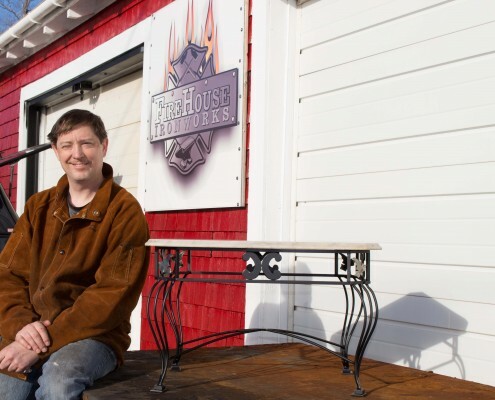 Centrally located in the heart of Cape Breton, Whycocomagh is just down the road from the towns of Baddeck, Mabou, Nyanza, Inverness, and Port Hawkesbury. We are about 35 minutes from the Canso Causeway. Beginning in 2019 we will have discounted student accommodations available at our sister company, Iron Mountain Wilderness Cabins. Stay in one of five off-grid camping cabins. There are also other seasonal accommodations in the local area at motels and campgrounds. Whycocomagh has a grocery & liquor store, several restaurants, two gas stations and convenience stores. There is also a provincial park near the forge for your enjoyment. 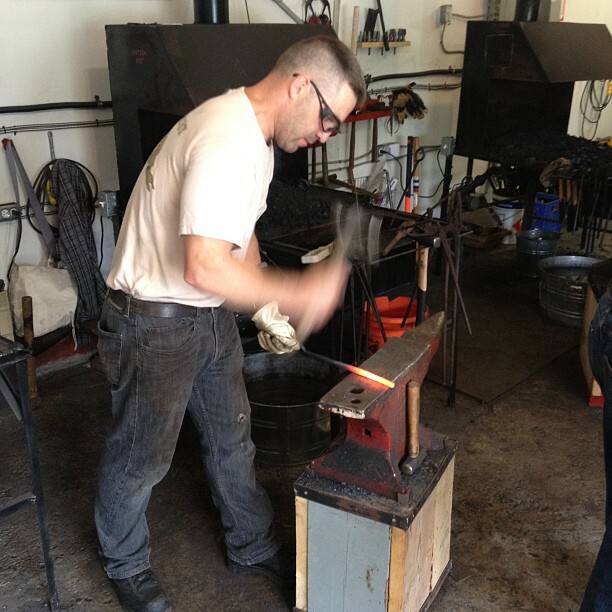 All students must provide their own Personal Protective Equipment, including safety glasses and steel toed boots. Ready to get started? Awesome! 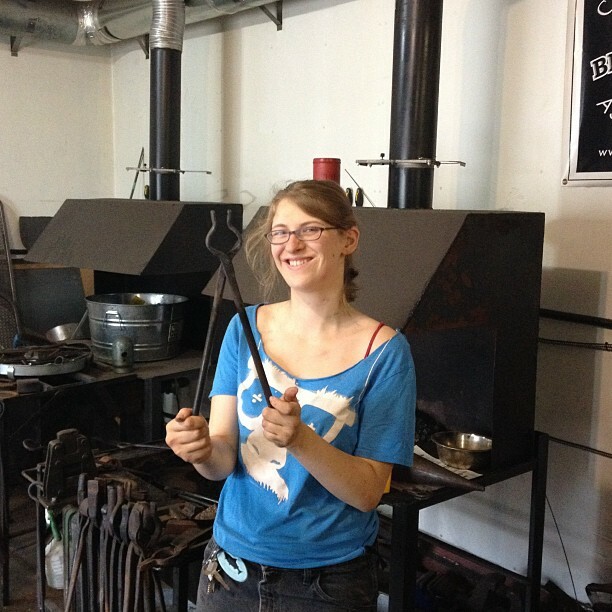 Register for our introductory, or level 1, level 2, or level 3 recreational blacksmithing classes.